Regardless of whether you're a first time home buyer or an experienced real estate investor, here at ThePLJGroup.com, you'll find useful information about how to choose the "right" property, making an offer, negotiating, financing, mortgage rates, relocating, and everything else involved in making an informed decision in today's real estate market. Peter Szwed (Broker/Sales Associate), Lorraine Zito (Sales Associate), and Juliette Gorham (Sales Associate), care about finding the right home for you. They also care about selling the right homes too! Bergen County, Starting with Alpine, Franklin Lakes, Oakland, Mahwah, Ramsey, Wyckoff, Upper Saddle River, Saddle River, Allendale. HoHoKus, to name just a few...as well as Ringwood & surrounding towns. Here at ThePLJGroup.com, this comprehensive online resource is offered to you in order to give you direct access to the latest properties for sale in your area. ThePLJGroup.com features extensive community information, consumer links, school information, free reports, answers to commonly asked real estate questions, and more. Peter Szwed, Lorraine Zito, and Juliette Gorham, want to give you the best, regardless of whether you want to sell properties or purchase property. They believe this is what you deserve, and that our clients are our most important assets! Remember that from Franklin Lakes, New Jersey, Manhattan is only a half hour away! Also here in Franklin Lakes, New Jersey, are some of the most beautiful and gorgeous properties & lakes. Some of New Jersey's great parks and open spaces are only just a short drive into the Highlands and up through Sterling Forest. Living in this part of Bergen and Passaic allows one to get into New York City, the Jersey Shore, many ski areas or the Appalachian Trail in just minutes...Who says you can't have it all....Peter, Lorraine and Juliette say you can! If you currently own property and are thinking of placing it on the real estate market, this site, ThePLJGroup.com contains information about preparing your home for sale, selecting the right agent or in our case , the right team!, pricing your home appropriately, marketing it effectively, going through the inspection process, and receiving a timely real estate market evaluation. 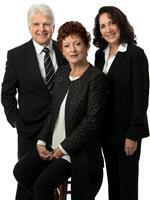 Peter, Lorraine and Juliette want to make your real estate experience a pleasant one & the absolute best it can be. Our business is driven by referrals, and we aim to please! This is a one-stop real estate website for all your home buying and selling needs in Bergen County and the New York Metro Area.